We accept Visa and Master Card. Preparing your order begins as soon as your payment is accepted by our bank. Debiting the account is made at the time of the shipment of the order (excluding exceptional reaching the incompressible time limit imposed by our bank: 10 days). In both cases the problem is the same, your credit card number is transmitted directly to the merchant who will use it in his establishment, via a conventional payment terminal, to charge you by sending it to his bank with the sum involved . So nothing prevents some employees of the trader to have access to this No., or that the database of that merchant is hacked (this has already been seen with blackmail). The security of your credit card number then depends on the management and securities that the merchant sets up, with respect to its staff and towards the outside (without questioning his honesty). When payment is simply "secure" (SSL or other), it means that the transmission of your Card number is encrypted to the site. It's a little better than nothing, because it means that your number cannot be intercepted on line (case rather improbable, in fact). But the problems mentioned above are possible. Upon payment you switch on a page counter to our bank CyberMut provider (a Credit Mutuel Service). So it is directly to the bank that you give your credit card information via a virtual payment terminal and secured with SSL (encrypted transmission). On our side we have sent to the bank the order number and the amount to charge you. We've no access to your credit card number via this system. If you absolutely want to call it us (some customers ask us) we will try to dissuade you for security reasons mentioned above. So if you accept our payment method directly through our siteonly the bank accesses your card no to process the transaction, which it used to do for all your card payments, including your usual merchants near your home. It has safety systems that go far beyond what can ensure you an ordinary website. If, despite these precautions, you do not want to use your credit card on the Internet, you can also pay by bank transfer or by check. No doubt you'll be faced with the security system enhanced 3D Secure set up by banks for internet regulation. Upon payment, our bank will switch on an interface of your bank so you can identify you. Crédit Mutuel: client must authenticate itself with its online banking login, then enter a code written on his "personal key card" (a grid of 64 4-digit codes in which you must draw the correct code depending on the line and column requested by the website). Banque Postale, Axa Banque and Caisse d'Epargne: the customer must indicate his date of birth. BNP Paribas: a code is sent by SMS. Société Générale: a code is sent by SMS. Crédit Agricole and LCL: the client must specify a personal password, created during the first use. BRED Banque Populaire: an authentication key Ip@b, credit card size CD. Groupama Banque: the customer must provide their name, postcode of residence and date of birth. Payment is accepted by your bank if authentication has been successfully verified. But it's needed that your bank has implemented the process with you in your contract. If this is not the case please contact your bank who will explain the procedure. However, it is always possible to pay by bank transfer or by check. However, if you insist to pay directly by providing us your credit card number by phone (+33 (0) 240200092), it will be used live to feed our (physical or virtual) payment terminal connected to our bank and will never be stored in our databases. Letters and packages are dispatched within 24h to 96h after receipt of your payment (subject to availability of items, restocking, excluding weekends and bank holidays). The usual shipping method is the lettre suivie or Mondial relay for packages. You will choose your preferred delivery method after validation of your basket. When your letter or parcel is sent, a tracking link will be sent directly to your mailbox. Free delivery from 59€ in Metropolitan France by Mondial Relay ! 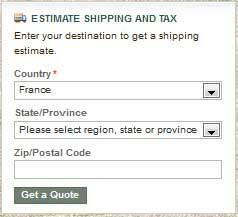 Shipping fees for France and abroad. Depending on where you live, the time requested, the weight of items ordered, we automatically offer appropriate delivery methods. No surprise, you can simulate the cost before paying in your cart. orders are neither prepared nor shipped on Saturdays, Sundays and public holidays. The shipping is calculated accurately, no disadvantageous package. What do the rates attractive if your order is increased to pay expansive packaged shipping costs? On a-et-a.com we adopted a different attitude. we have implemented a sophisticated calculation of the shipping depending on the weight of the item, the delivery distance and speed of service requested. This allows us to stay close to our shipping costs. So you are no longer penalized by small orders (there is no reason to not buy big ...). You can do a simulation of order on our website to test this aspect. You can simulate the estimated amount of the shipping by viewing your cart (click on "My Cart" at the top left). Simply fill and click "Get A Quote" different shipping options then appear. Once you have chosen one of them, just click "update total", you'll have a complete overview of what you'll pay. Of course your choice can be reviewed at any time. You can then click on "Order" when your choice is final. If you skipped this step simulation by clicking on "Checkout" at the top left, nothing is lost because the choice of the shipping will be required anyway before your payment. It is specified that the present conditions govern the a-et-a.com sales, for all items proposed on this website. These products are sold new (unless otherwise indicated). These conditions are valid excluding all other conditions, including those applicable to sales in store house. These conditions may have been translated into languages different from French in order a better reading comfort for our customers, however, if differences of meaning are found, only the French version shall prevail. Professional: in the remainder of this document, is considered as a professional anyone ordering products or services on a-et-a.com using them in the context of his professional activities registered as such in his country. A professional can be registered, at his request, on a-et-a.com. Association: is considered as an association, any person ordering products or services on a-et-a.com using them in the context of a non-profit association, registered as such in his country. An association may be registered, at his request, on a-et-a.com. Individual: is considered as individual anyone ordering products or services on a-et-a.com and not being part of the previous categories. 1.1 - Our products prices are indicated in euros all taxes included, excluding the cost of shipping and handling (see shipping terms in the online shop A&A). 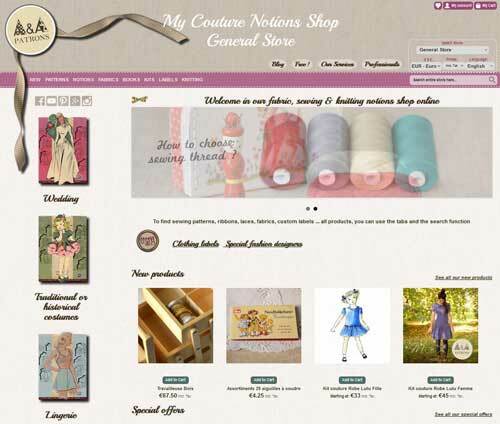 Our online store offers the ability to display the price in other currencies but for informational purposes only. Only the amount indicated in Euros is contractual. 1.2 - For orders to countries other than France, you are the goods concerned importer. For products shipped outside metropolitan France (including overseas), the price will be calculated excluding taxes automatically on the invoice .. Customs duties or other local taxes or import duties or state taxes are also payable. These taxes are not under a-et-a.com responsability. They will be your responsibility and under your full responsibility in terms of returns and payments to the authorities and bodies in your country. We advise you to learn about these issues with your local authorities. For the European community countries, selling duty free is for firms that have provided us their contact information and their Intracommunity VAT number (in the dedicated zone of the order). Individuals within the European Community are subject to purchase taxes included. 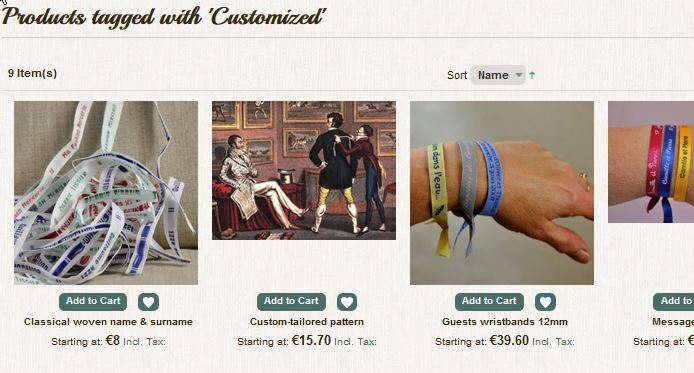 1.3 - All orders regardless of their origin are payable in Euros. 1.4 - a-et-a.com reserves the right to change prices at any time but the products will be billed based on rates in effect at the time of order (if it is available). The products remain the property of a-et-a.com until full payment. Commonly via Internet on the website: www.a-et-a.com. You can also order by mail and join your check payment in euros drawn on a France resident bank to: A&A Patrons Villerussien 41500 Maves France. Contractual information is presented in French and will be confirmed with all the contractual information at or before the time of delivery. When you click the "Place Order" button after the checkout process, you accept it as well as the entirety of these Terms & Conditions, without reserve. The data recorded by a-et-a.com is the proof of all transactions between a-et-a.com and its customers. The data recorded by the payment system constitutes proof of financial transactions. Our products are available within the limits of available stocks. For products not stocked in our warehouses, our offers are subject to availability from our suppliers. - Or if not possible, by mail as soon as possible. The times indicated are average times and correspond to the time of treatment and delivery for products destined to metropolitan France and Monaco. In case of items delivered on different dates because of their availability, delivery time is based on the longest time. a-et-a.com, however, reserves the right to split deliveries. The participation fee for processing and shipping. will be charged for only one shipment. In the event of unusual delay, an email will be sent. by credit card: Visa, MasterCard, (see other cards list in our online store). Preparing your order begins as soon as your payment is accepted by our bank. Debiting the account is made at the time of the shipment of the order (excluding exceptional reaching the incompressible time limit imposed by our bank: 10 days). by check accepted only if the check is issued from a bank account domiciled on the French territory. Preparing your order begins as soon as your check is received.. The cashing of the check is made at the time of shipment of the order. by bank transfer (our bank details are shown if you choose this method of payment). It is the customer's responsibility to email us proof of payment order to the bank. Preparing your order begins as soon as your payment is accepted by our bank. In order that payment specific modes are applicable to him, the professional must have requested and obtained a business account to a-and-a.com. Deferred payments are only accepted after our agreement (revocable at any time) and after, at least, a first order paid cash more than € 50 . There are only accepted for orders exceeding a total of € 50.
professional having obtained a deferred payment agreement (see indicator on your account), opting for a deferred payment, will select the "Cheque" or "Bank transfer" at the time of payment of his cart in our online store. Concerning Bank transfer, it is the customer's responsibility to email us proof of payment order to the bank. The deadline for payment is indicated on the invoice enclosed with the delivery failing it is the 31st day following the date of receipt of the goods or the end of execution of the service. additional compensation, if recovery costs actually committed are higher than lump sum, particularly when using an office responsible for reminders and warnings, additional compensation with our justification will be required. As penalties, the compensation is due the day after the due date. The transaction is provided by our partner, Credit Mutuel, which adopted an encryption system protecting sensitive information related to payment. On our web site we never have access to your credit card number. 8.1 - You have 14 days from the receipt to return the product which does not suit you. The only condition before returning products is telling us about your withdrawal (by email or mail, see our goods return policy) and have received an acknowledgment from us. Return costs will be at your expense. Only the price of the product purchased and shipping delivery fees (at the most economical price) will be refunded. 8.1 - The withdrawal right, applicable to the European comunity individuals does not apply. However, you can waive all or part of your order by contacting us within 7 days from receipt of the goods (by email or mail, see our goods return policy) . Return costs will be at your expense. Only the price of the purchased products will be refunded, shipping charged being retained us. 8.2 - The same products as those mentioned in the previous paragraph 8.2 can not be returned in this context. 8.3 - We promise to refund or exchange products that do not match your order (non-compliant). You have 14 days from receipt of the order to report any anomaly. 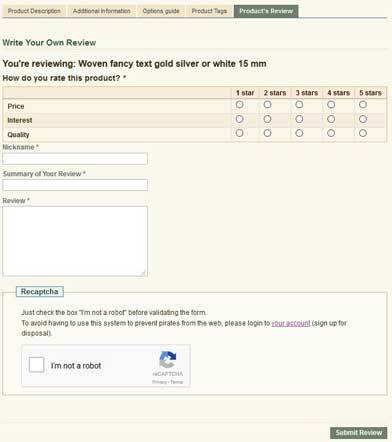 In this case, we ask you to make a detailed statement by email or mail (see our dedicated form) with your order reference and send back the product(s) after our agreement. a-et-a.com will exchange or refund the product(s). In the cases referred to in section 8.3, in case of refund, the shipping costs charged will be refunded. 8.4 - For defective products under warranty, the customer must give us the description of the fault via our dedicated form. After analysis We will provide him the repair procedures. Within metropolitan France, the delivery costs to the place of repair will be at our expense (after client communication and acceptance), the cost of returning to the customer's original place of delivery will be paid by us in the same limits. 8.5 - Refunds, accepted by us, will be made within a period not exceeding 14 days after the goods receipt by us. Reimbursement will be by default to the same account and using the same payment method as those used for the purchase by the customer. Another way of reimbursement may be used after approval of the customer and acceptance of a-et-a.com. 8.6 - No sending in against-refunding will be accepted, whatever the reason. As part of the guarantee of certain products (eg sewing machines) excluding legal withdrawal delays, the cost of sending and return will be your responsibility. All texts, comments, works, illustrations and images reproduced on the a-et-a.com website are reserved under copyright as well as intellectual property, worldwide. For this reason and in accordance with the Intellectual Property Code, only the use for private use subject to different rules even more restrictive code of intellectual property. Any other use constitutes infringement and is punishable under the Intellectual Property without prior authorization of a-et-a.com. 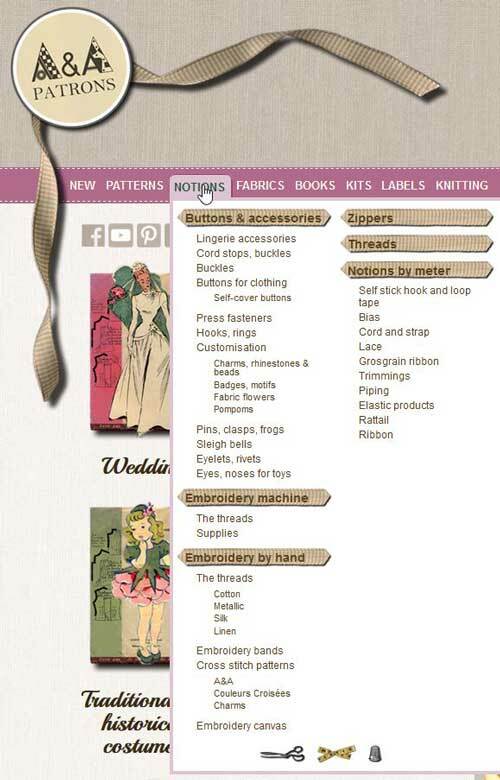 Reproduction in whole or in part of a-et-a.com catalog is strictly prohibited. The products are conform to French legislation. The responsibility of a-et-a.com can not be held liable for failure to comply with the law of the country where the goods are delivered. It is your responsibility to check with local authorities the possibility to import or use of products or services you plan to order. The photographs and texts, and illustrating the products are not contractual. Therefore, the responsibility of a-et-a.com can not be held liable for errors in any of these photographs or one of these texts. a-et-a.com can not be held liable for breach of contract in case of shortage of stock or product unavailability, force majeure, disruption or total or partial strike of postal services and transport and / or communications, flood, fire. a-et-a.com shall not be liable for all damages because of this, business interruption, loss of profits, loss of opportunity, damages or expenses. a-et-a.com disclaims any responsibility if the contents of these websites violate the laws and regulations. If any provision of these Terms & Conditions is declared invalid, the validity of the remaining provisions shall remain unaffected. The reference language of this contract is the French language. For any disputes that may arise between our clients and us, the Court of Nantes (France) will have exclusive jurisdiction, regardless of the method of payment and delivery conditions, even in cases of warranty appeal or multiple defendants . a-et-a.com will not disclose to third parties the information you provide. These are confidential. They will be used by its internal departments for processing your order and to customize and enhance communication and offer reserved for a-et-a.com customers, including the newsletters a-et-a.com which you will have subscribed and as part of website customizations based on your interests. This article can not prevent the sale or transfer of our activities to third parties. Therefore, in accordance with the Data Protection Act of 1978 January 6th, you have the right to access, rectify, and object to your personal data. a-et-a.com subscribes to the professional code of the "Fédération des Entreprises de Vente à Distance" and respects the charter of the profession.